Massages can be healing, relaxing and uplifting for the body and mind, and high-quality massage oil can do wonders to enhance the benefits of a massage. 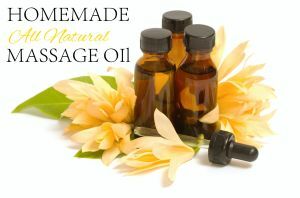 Although massage oils are often thought of as an expensive and luxurious product you buy at a salon or spa, it’s actually quite easy to make your own custom massage oil blend at home. The size is up to you, but the most important thing is that the glass is dark or tinted in some way. This is to protect your oils from going rancid. Coconut oil: Coconut oil will give your blend a tropical scent, as well as all the benefits to your hair, skin, and nails that coconut oil is so well known for. Sweet almond oil: This is probably the most widely used massage oil as it spreads well and is easily absorbed by the skin. It has a mild, nutty aroma that blends well with many different scents. Cold-Pressed sunflower oil: This is a great budget alternative to sweet almond oil. Rich in vitamins, it also spreads just as well as sweet almond oil and has a very mild scent, which makes it very versatile. It does tend to leave a little extra grease on the skin, however. Grapeseed oil: This is a light oil that works best with oily skin types. High in vitamins, it is almost odorless, which means it will mix well with any scents you choose. Olive oil: This oil tends to be thicker and greasier than the others and has a stronger smell. The benefits of the oil, however, are that it can effectively soothe joint and muscle pain, as well as improve skin strength and elasticity. Good for very dry skin. You can make a good massage oil using only one of these, but most massage oil blends use three or more. As you become more experienced at making your own blends, you’ll get better at mixing and understanding what oils work well together. As a general rule, you’ll want to use about 70 drops of essential oils for every 8 oz. of carrier oil. To blend the oils, drip the essential oils into your glass bottle first, then add the carrier oil. Put the top on the bottle, and then roll the bottle between your palms in order to blend the oils.